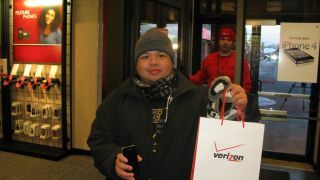 Do in-store Verizon reps push Android over iPhone? Or are they simply stressing the benefits of 4G? Ever since Apple's iPhone made the jump last year to carriers besides AT&T, those carriers' 3G networks have suffered under the extra stress brought by data-heavy iPhone users. In fact, Sprint began offloading prepaid customers from 3G to 4G to lighten the iPhone's burden on 3G. Perhaps that explains why Verizon employees in online and brick-and-mortar stores appear to eagerly encourage customers to purchase 4G-ready Android handsets over Apple's iPhones. As anecdotal evidence mounted on message boards and social media, CNN underwent their own investigation, chatting with Verizon store representatives and feigning interest in purchasing a smartphone. Their findings are in line with the anecdotes. In each of 10 separate conversations, the Verizon employees stressed either the Motorola Droid Razr Maxx, the Droid Razr, or the LG Lucid over Apple's iPhone. Employees who were asked upfront for an iPhone didn't immediately attempt to deter them from purchasing it, but when asked for their opinions, every one recommended a 4G-ready Android phone instead. "Verizon is really pushing 4G," one rep even said. Apple's iPhone is not compatible with Verizon's 4G network, so it makes sense that Verizon would emphasize the purchase of other phones. The 4G network is significantly faster (up to 10 times) than 3G, and 3G networks have been strained since the iPhone jumped to new carriers last year. In addition, Verizon and other carriers pay larger up-front subsidies for the iPhone than for other devices. But according to the report, AT&T - which they rightly point out faces the same obstacles as Verizon (although they've had years more to adjust their 3G network to the iPhone's numbers) - stressed the iPhone over any of Apple's competitors. TechRadar reached out to Verizon, and they officially "declined to comment" on this story.